SkyTruth – How Do We Help? You can never know how much you’ve helped our effort. In our pain and anguish, we never found the Butte, Montana, mine. We always looked for a uranium mine. However the Berkeley Mine is pertinent because of the devastation to their water. We’ve always believed that there was one issue that would save us… and that is water! Your photos of the Berkeley Mine led us to diagrams of the dewatering of their area. That mine is literally across the street from Butte, Montana, and the people with private water wells were probably hooked up to city water (that fact is no excuse for this disaster),but what will we do when our water table is lowered and our water wells run dry? We are 9 miles, as the crow flies, from city water. The Fremont Board of County Commissioners voted to approve Uranium Exploration within 500 feet of 44 land and homeowners. They’ve stated that they do not believe they can “take” the rancher’s minerals. They won’t exercise their own authority to deny an inappropriate adjacent land use to our homes and retirement properties. Water is our last weapon. 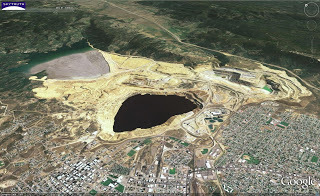 Your photos lead us to examples of how massive dewatering affects the area. Not only by the absence of water, but by the contamination of the water that infills the contaminated hole that is left. More than one mine in Montana has to have water treatment in “perpetuity.” Who pays for that cost? Taxpayers! It’s disgraceful to allow this to happen. It’s a waste beyond words… of precious Western water, and taxpayer resources. How can these backwards legislators continue to vote to allow this kind of thing to happen when the results are so proven to cost multi-million dollars more than the few jobs these projects bring? Thank you, more than words can express. Doesn’t mean that they will do the right thing, but it’s a fantastic start! 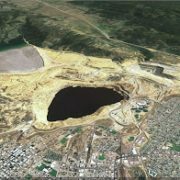 https://skytruth.org/wp-content/uploads/2009/05/SkyTruth-Berkeley_Pit_Butte_MT-2005-GE-panorama-2.jpg 196 320 John Amos /wp-content/uploads/2016/08/test_logo.png John Amos2009-05-26 17:55:002019-03-05 11:38:50SkyTruth - How Do We Help? Gold Mining In the ‘Hood: Morro do Ouro Gold Mine – Paracatu, B... SkyTruth – How Do We Help (Part 2)?